Mmmmm. I love for my house to smell good. In the autumn, I want it to smell like cinnamon and cloves (click here to read how I do that). But now that we're in the last stretches of winter and heading quickly toward spring, I want my house to smell a little lighter, a little fresher, but still warm and welcoming. I discovered a way to create just the aroma I was wanting, and it couldn't be more simple. In fact, it requires just two ingredients. Peel an orange. Put the orange peel into a small pot. Fill the pot with water, then squirt in some vanilla extract. Bring to a boil, then simmer. Be careful not to let the pot boil dry. Vanilla extract is the secret weapon here. Yes, it's expensive, but you'll be so glad you used a teaspoon or two for this! 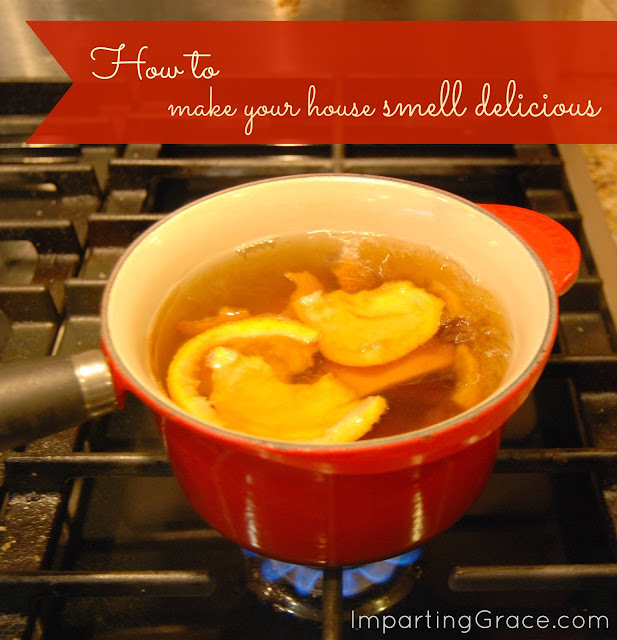 Do you have a great method for making your house smell good? Please share! I used to do this long ago and had kind of forgotten about it. My secret for making the house smell good is making sure it is clean. Most of the time. :) I also use candles and some plug ins. This sounds wonderful. I just happen to be off today and think it's the perfect time to try it. I just love the smell of orange and vanilla! You might also recommend to put cooking spray in pot so that the liquid doesn't stick to the pot. I have had a heck of a time cleaning pots after doing this and once I tried adding the spray, the stains came right out! This is a great tip! Thank you for sharing it! I bet that smells so good! I love this simple idea. Thank you! I am wondering if you would also share how you make those cute transparent banners for your photos to put text on top of? I'm not a blogger, but I have a photo project I would love to do this with. What software do I need? Thank you so much. Trying this this week! I walked in here yesterday afternoon after carpool and was thinking to myself...not fresh!! Can't wait to try your solution:)! 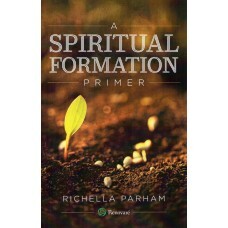 Thanks, Richella! I'm anxious to go try it. Hi Richella, Your name is so pretty, I believe it has a special meaning. But, I was going to say that when I bake everyone says; it smells so good in here. But I think the very best scent is when I use maple flavoring, Now that really lingers. Years ago my Grandmother wore vanilla as a fragrance. I want to try that! I'll just bet my family comes in hungry wanting to know what I've cooked though! Richella, this sounds wonderful. 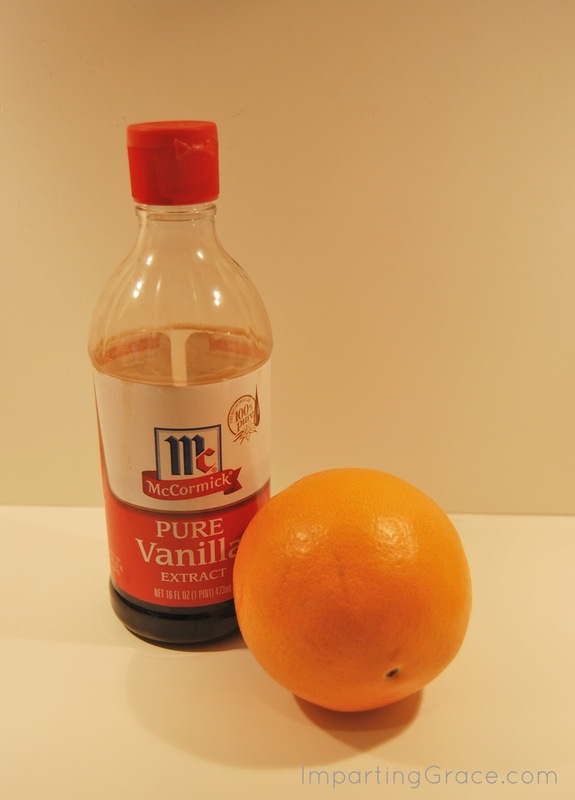 I haven't tried the orange with vanilla. I've bought that combo in a candle; but, this is definitely something I'd like to try! Thanks for sharing! I just did a post where I highlighted one of my very favorite candles - it's Trapp orange vanilla! I will try this and see if I get the same result for a lot less. Thanks! or go for a paid option? There are so many options out there that I'm totally overwhelmed .. Any suggestions? Many thanks! I'm absolutely imagining how wonderful this would smell. I wonder if you could heat this up and then use one of those candle warmers to keep it going rather than risk having it go dry on the stove? I'm terrible about leaving things on the stove top and completely forgetting -- do you know how "stinky" boiled eggs can be if you forget they are cooking....lol!